I have been a little remiss in the area of time management lately and have managed for a couple of months to do no preparation or painting, not just of the Peshawar project but pretty much of anything. Some of it I can put down to a combination of beer and rugby, but mostly it has been too much work combined with inertia. I decided tonight to finish the painting and basing of two test pieces. They are the ones illustrated. I am trying to decide whether to use a sand/dry brush/a little flock for the base or just flock only on a dark brown base. I am leaning towards the base on the right. The images are a little out of focus – I guess macro on my phone is not as good as it could be. The squares you see a 10mm by 10mm giving you and idea of the size of the figures. I am sure I will look at these figures again 30 or 40 times before I settle on one form or another. I’d go with the one on the right. The dry brushed sand looks to be way out of scale. Where did you get the miniatures. Look very nice. They are from Irregular Miniatures. 2mm blocks. 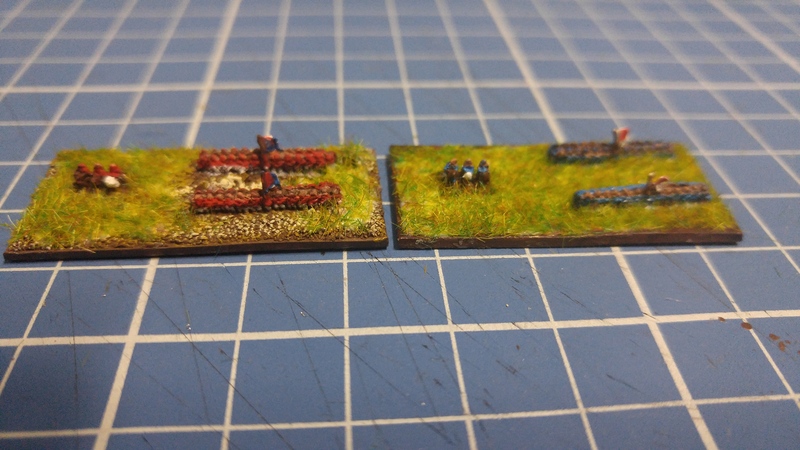 Brigade Miniatures also do some ultra small figures at about 2.5mm size. Oddzial Osmy do some lovely 3mm size figures. Look at Magister Militum website for info of them.